Find ideas for small architecture holiday gifts or birthday gifts kids will love to spend time on with you. 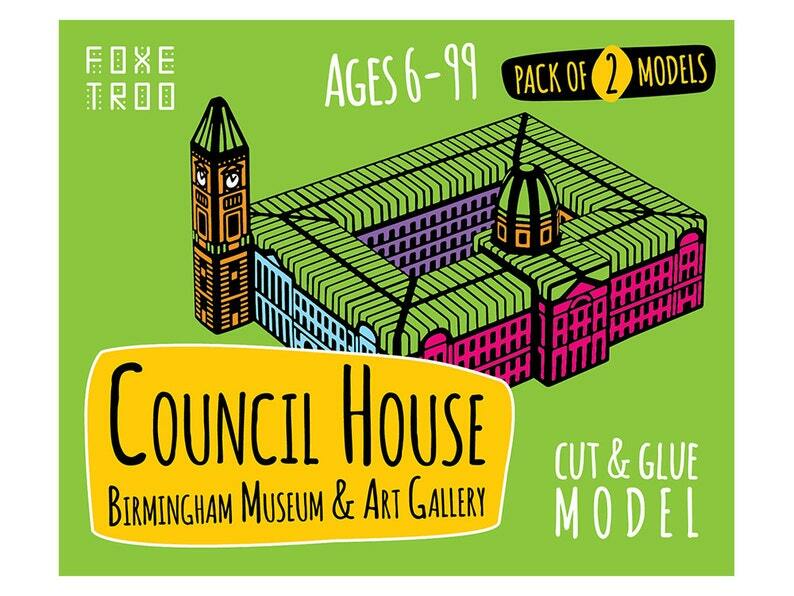 Help two curious porcupines Foxe and Troo to rebuild the Birmingham Council House their own scale and taste! Foxetroo paper model craft kit comes with all the necessary details and instructions for you to cut out and glue the models quickly and easily - and the fun just begins! Play with two lovely porcupines, start collecting more models and ultimately build your very own lively town. Foxetroo models are designed so that kids need to make simple three-dimensional solids (such as cubes or cylinders) first and then connect them into a final model. Together with the graphics this will then resemble a recognizable architectural building. It's made easy for kids to assemble while developing their cognitive and motoric skills. All the parts needed to make the particular building are housed inside a convenient pocket size kit. Assembling instructions and diagrams printed on the inside of the cover show the most important steps in building the model. Foxetroo kits contain TWO SETS of cards – assemble both models yourself or invite someone to help you. We call them cards due to their appealing rounded corners which resemble playing cards. Each set contains a title card, a porcupine card and the blueprint cards. The size of the cards is perfect for cutting out the parts of the model. 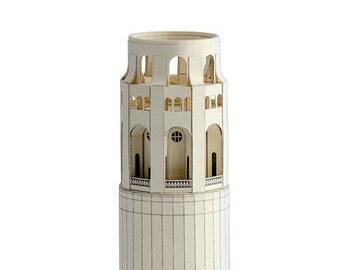 The cards are printed on carefully chosen paper selected to make it simple to cut and fold, so a six year old can achieve it while still ensuring the assembled models look sturdy. The title card carries a name of the building on one side - use it for standing your finished model on. The reverse side of this card shows a short dialogue between Foxe and Troo - they are discussing fun things about the building they are visiting. First cut the porcupine figures out. Then score and fold along the green dotted line and glue parts together. Foxe and Troo will be glad to help you with the rest of the building process. 1 - on the front side you will find graphics of all the exterior details - like doors, windows, balconies, roofs etc. 2 - on the reverse sides of the cards the cutting and folding patterns are printed. As the graphics and the cutting pattern are printed on two different sides, it makes it easy to focus on cutting the parts out smoothly and precisely, as well as following the guidelines to assemble the model correctly. The main bonus with our design is the lack of written guidelines on display on your finished masterpiece, as they are on the reverse of the cards. Numbers on both sides of the blueprint cards ease the assembling of the model - just follow the sequence. Cartoon-like freehand graphics and a playful palette of vibrant colours make the buildings appear alive. Black borders define the edges, sometimes they make an illusory appearance of the shapes. Yellow's role is simple yet important - it shows you where the glue should be applied. No fancy tools are needed - just scissors, a pen, a ruler and a glue stick (we recommend a solvent-free green SCOTCH stick). All the parts of the kit, including the package, are made from materials that are safe for children, non-toxic, environment friendly and conform to EN71, ASTM F963 and CPSIA 2008 safety requirements. We recommend the kits for anyone aged 6 to 99. Please be aware that the kit is not suitable for children under 6 years! The assistance of an adult may be advisable for 6-10 year olds. We are shipping this item 1st Class Standard (not trackable) from Cheltenham, United Kingdom via Royal Mail. Royal Mail aims to deliver our kits and models to you in 1-3 business days across the UK Mainland, in 3-5 business days within Europe, in 5-7 business days to USA & Canada and in 7-9 business days elsewhere; however, this is not guaranteed, particularly international deliveries may exceed the expected delivery times due to different reasons and so we encourage patience. The shipping time is added to the processing time. When you are finished with building your model, don't forget to sign your work! Share it with the world - take a photo and upload on Instagram with a hashtag #foxetroo. Start a convo right here or visit our website http://www.foxetroo.com for more information.